The Village lies between Guilsborough and Creaton. In the census of 1841 when the Church was built the population was recorded as 273. Today Hollowell has some 400 inhabitants. There is now no pub, no school nor shop. Social activities are led by the Hollowell Hens. There is an active Sailing Club on the nearby reservoir and a Pocket Park containing a well equipped children’s playground. The Village Hall, a nineteenth century former school, is regularly used and well maintained. Over the first weekend in July Hollowell becomes a major centre of activitiy, with tens of thousands of people converging on the fields above the village for the Steam Rally and Heavy Horse Show. The first rally was held in 1986 to raise funds for the church roof. The committee is now able to give away £60-70,000 a year to a host of local charities, with the church and village hall major beneficiaries. 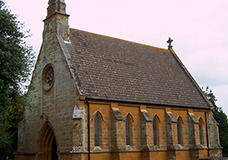 The Church of St James, Hollowell, which is open every day, seeks to play an active part in village life. It can be found at the top of Church Hill Hollowell, postcode NN6 8RR. There is a car park at the back of the Church. St. James is valued for family events: weddings, baptism and funerals. There are two morning services each month and the Church hosts the Uplands Group Service twice a year. Congregations vary from 7 - 75 depending on the type of service. The Church holds a Harvest Festival, a Remembrance Sunday Evensong and an Easter Evensong. Supporters of the Hollowell Steam Rally from outside the parish attend the Christmas Eve Carol Service. There is a rota for flowers. Refreshments, usually after matins, are provided by informal arrangements among parishioners. Other PCC members include: Mr. M. Milner (Hon. Treasurer), Mr. R Carnell, Mr M. Baker-Bates (Hon. Secretary), Mrs G. Brown and Mr G. Frost. St. James, Hollowell, is the most recent of the churches in the Uplands Group. Dating from the early years of Queen Victoria’s reign it was built as a chapel-of-ease for those who could not easily attend service in neighbouring Guilsborough. At the time people were still hanging on to the eighteenth century ideal of a single space, where all present could see everything without being hidden behind a pillar or cut off by a screen. Here the single space is given a gothic style with tall lancet windows. Rev. J .D. Watson who built the Church is said to have been influenced by his travels in Italy, which may help to explain the details of the apsidal East End. Inside the Church notable features include the stained glass windows in the Apse, the rose window above the West Door and the embroidered kneelers at the altar rail and in the choir stalls. Inside the Church notable features include the stained glass windows in the Apse, the rose window above the West Door and the embroidered kneelers at the altar rail and in the choir stalls. More detail can be found in the guide leaflet available inside. More detail can be found on the guide leaflet inside. The Uplands Group of Churches takes safeguarding extremely seriously. Please visit the safeguarding page of this website for information.